Learn Norwegian - Enjoy the Story. (Level A1/A2). We all hate these dull Norwegian courses that begin with “Hello, what’s your name?“, don’t we? The Mystery of Nils is a coherent story, which starts very simply, but develops into a fascinating novel. Can’t stop reading? Well then ‒ you will have to learn Norwegian! 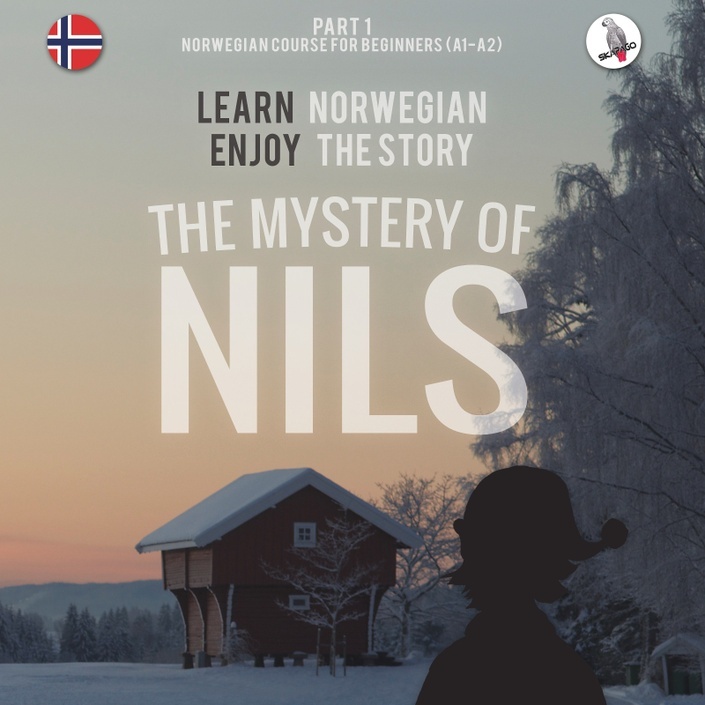 In this course you will be able to read the story and listen to it as well - it is read by native Norwegian speakers. We have carefully selected the most frequently used words in the Norwegian language and made sure that the story is primarily made up of them. Separate texts and exercises focus on conversational topics that will prepare you for living in Norway. Recorded video of the vocabulary will make it easy for you to pronounce new words correctly. Grammar is a headache? Not with The Mystery of Nils. Uncover the structure of the Norwegian language with casual yet comprehensive video explanations, pictures, and a lot of easy to remember examples. Practice online as much as you wish. Repetition is the key to learning a language. This course contains a great number of exercises for fluency, listening comprehension, vocabulary use, and grammar, as well as videos about pronunciation, and a whole lot more. Download exercises for listening comprehension on your smartphone or computer so that you can repeat them wherever you are. Get help from live teachers. Our Norwegian teachers have co-created this course. They know all the obstacles you might incur and can help you with individual training through Skype (at an additional rate). You will also be a member of our Facebook community, where you can meet other students and ask questions to real teachers. In our Facebook community you can meet other students so that you can support each other, exchange learning strategies, find learning buddies ... and whenever you feel stuck, you can also post questions and get help from more advanced students or "real" Norwegian teachers. Erna Langvik gives her eight year old granddaughter a special birthday present: a doll inspired by the traditional Norwegian mythical creature Nisse. Nils ‒ as the doll is called ‒ leads a happy life with his new family in Oslo. But due to an accident, Nils finds out that he means a lot more to Erna than just being a birthday present. Without knowing it, he has been carrying a painful secret, and during an adventurous trip to Northern Norway, he helps Erna to make one of the most important decisions of her life. Not happy with the course? Get a refund! Test this course for 30 days and email us any time if you‘re not happy - we will issue a full refund. No strings attached. Also you can cancel your subscription every month. For all refund requests just send an email to info@skapago.media or info@skapago.eu. Werner Skalla is a co-founder of the online language school Skapago. He is fluent in five languages and has been teaching Norwegian and German since 2009. Werner has co-created this course together with a team of Norwegian teachers and students learning Norwegian at Skapago. Can I meet other students? You can meet other students in our Facebook group, where you can exchange learning strategies, share your experience, and ask questions. Can I get help from a teacher? In our Facebook group you can ask questions that our teachers will answer. You can also get 1:1 live training through Skype (at an additional price). What if I‘m not happy with the course? Can I get a refund? How much time should I dedicate to this course? Since this is a monthly subscription, you can dedicate as much time to this course as you wish and learn at your own pace. There is no risk of "falling behind", and you can repeat as much as you want. However I do recommend that you work with this Norwegian course every single day - even when you have just a few minutes. It is much better to learn 10 minutes every day than one hour once per week. Send us an email at info@skapago.eu and we will be happy to answer your question. Not happy with this course? Get a refund. NOTE: If you are based in an EU country, value added tax (VAT) will be added to your subscription due to new EU regulations. Choose your country during the checkout process to see your price. The price shown is the price per month. NOTE: If you are based in an EU country, value added tax (VAT) will be added to your subscription due to new EU regulations. Choose your country during the checkout process to see your price. The price shown is the price per year.